ThermHex honeycomb cores are produced in different core thicknesses and cell sizes. Honeycomb cores can be produced with densities of 60 – 120 kg/m³. Our standard honeycomb core has a density of 80-90 kg/m³ and has a compressive strength of 1. 2 MPa and a compressive modulus of 40 MPa. The standard dimension (wxl) is 1200mm x 2500mm. Other dimensions are available on request. ThermHex honeycomb cores are finished with a PP barrier film and a PET nonwoven as standard. In the nomenclature, “F” refers to the use of a PP barrier film which prevents resin take up during the lamination process at our customers. “N” means the use of a PET nonwoven to ensure bonding with the resin system during further processing by our customers. 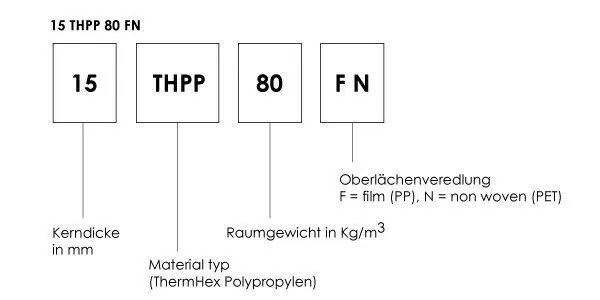 The nomenclature of ThermHex products is easy to grasp. The product name provides all essential information at a glance. Here “12” stands for the core thickness, “TH” for ThermHex, “PP” for polypropylene and “80” for density. “S” indicate the sheets are slitted in a 50 x 50 mm pattern, which allows the PP core to follow curved shapes while being processed at our customers. ThermHex honeycomb core should be stored flat and horizontal in a dry and covered area. Please protect material from UV sunlight and extreme temperatures. If surface moisture is present please, dry prior to use.